Good morning bloggers! 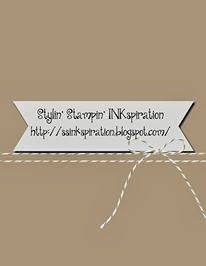 I want to share with you my card using our sketch this week over at Stylin' Stampin' Inkspiration. Click the header above to come on over and join us this week for our challenge. We are always interested in seeing everyones projects! Here is our card sketch for this month! A great simple sketch, but yet the door is open to do so much with it! And this is my take on it! I needed to create a card for a upcoming Birthday and wanted to make it simple but fun! I like how I created the wave of small banners using the new DSP "Retro Fresh" under the sentiment banner. To get the rope looked ribbon at the bottom, I tore apart a piece of burlap ribbon and tied to together in sections. I hope you enjoyed my creation and decide to create one of your own. Don't forget to leave me some "love" and head over to our main blog site to take a peak at our other design team members projects I hope we will INKspire you to create with us! I absolutely love your card! SO CUTE!